The elephant. A majestic figure of great size living in harmony with its disparate surrounding. Here grandeur meets peacefulness. An awe inspiring reality for humanity. Even lions withdraw from the water when the elephants appear. A natural respect towards the subtle power of grandeur. The elephant is eminently viewed positively by all cultures worldwide. Half of the world’s populations already venerate the elephant as a symbol of luck, of wisdom and of great intelligence. Asia and Africa have a very special connection to their respective elephants and most honour this animal under different forms. The Asian elephant appears in various religious traditions and mythologies. They are treated positively and are sometimes revered as deities, often symbolising strength and wisdom. Similarly, the African elephant is seen as the wise chief who impartially settles disputes among the forest creatures in African fables, and the Ashanti tradition holds that they are human chiefs from the past. India has many divine figures using an elephant such as the thunder god Indra, head of the Hindu deities and Kama, God of Love. But most of all, India venerates Ganesha, an elephant headed God also named “The Remover of Obstacles”. The son of Shiva and Paravati, he is called upon at each start of a new business so that Ganesha may remove the possible occurring obstacles beforehand. The Botthisava becoming the historical Buddha chooses to appear to his mother Maya in the form of a white elephant before entering her body. The elephant, the most noble of all, the subtle power of the real majesty of the animal realm, is chosen by the Buddha before entering the world of human forms. India, far East and Africa seem to be privileged to establish a special connection to the elephant but even the Near East and with it the Arabic world designates the year 570 AD as Âm al-Fîl: The Year of the Elephant. It is the very year the prophet Mohamed was born. In 570 AD an enemy troop was advancing towards Mecca with the will to destroy the Kaaba. The elephants within the troop dismantled the battle by refusing to enter the city. They seemed to have had access to the knowledge that Mohamed was about to be born and honoured his place of birth with their powerful peaceful gesture. The West has known the elephant since ancient times. In Antiquity, the elephant was attributed to Mercury due to his intelligence. The Physiologus, an influential text inspiring folk stories and many wise thinkers of the Occident since 400 AD, makes the analogy of the elephant with Adam and Eve and goes as far as designating the true sacred and spiritual elephant as Christ, the only one having the strength to lift Adam up from his Fall. The Physiologus described the elephant as an animal once fallen unable to stand up again on his own. Only his own prodigy will be able to lift him up on his feet again. Charlemagne received a white elephant from Sultan A in 797 as a sign of peace. The animal lived in Aachen (Aix-la-Chapelle) and the North for 8 years before he succumbed to the cold. His death was worth being mentioned in many chronicles of the day. In modern times, our Boeing 747 was given the name “Jumbo” honouring the memory of Jumbo the elephant who left the London Zoo and the United Kingdom in 1882, to the distress of many citizens, to join the New World. The elephant an eminently positive symbol for the world. Combining grandeur, social competence, and wisdom with a peaceful attitude. 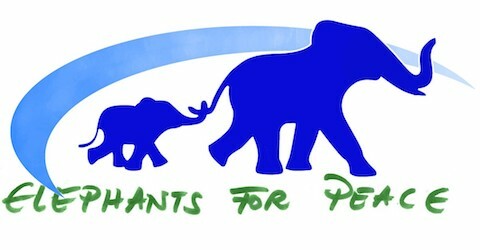 Will the elephant finally be able to give earthly peace an image? The Peace Dove, a heritage of Aphrodite and of Noah lived a long time in our Western World as the symbol of the Holy Spirit until it was Picasso, or better Louis Aragon, who transformed the Christian symbol into a universal symbol of Peace. Or is it not rather the idea of Peace that the Peace Dove stands for? ￼What qualities do we ascribe to its earthly counterpart; the pigeon, the animal that Picasso had depicted on the original painting decorating the walls of Paris in 1949 for the World Congress of the Communist Party? Do we love pigeons? What does this animal inspires us to be or do? The animal that leaves when a two year old arrives. It seems that peace has to leave when a human appears. The Church is one of the biggest fighter against the earthly manifestation of the species of peace in the name of safeguarding its monuments. It goes without saying that this creature definitely needs a strong partner, that lives on earth, that is admired by most and that can defend its position with ease. How to introduce a new symbol to the world? How to make it enter the collective consciousness? By putting it to the test. Does the symbol function? Then peace should reign when it appears. Does it move the minds and hands to act differently than with fear? Can it produce a peaceful reality? The first test was made at the internal and conflict ridden dividing line of Cyprus. An unaccepted political border separating Greek and Turkish speaking Cypriots, since 1974. With artistic contributions in elephant form from participants of many nations, the test was done at Ledra Street checkpoint in Nicosia Cyprus on May 9 and 10, 2009. The result: the checkpoint area was transformed into a place of joy and mutual festivity. The mayors could meet and greet each other warmly in front of running TV cameras and public from both sides making an all human desire reality: living harmoniously and in peace with each other. The success was such that many newspaper articles proclaimed the new peace symbol: the Elephant Symbol of Peace. The process continues. You can be part of its making. Introducing a strong and powerful image for world peace. Spreading the admired qualities of an existing creature on earth and finally offering peace a universal home on planet earth.